This highly prized Sheraton property isn’t your ordinary chain hotel. It was built on the site of one of the oldest French Opera Houses in the U.S., and today, young opera singers perform in its lobby bar. The biggest allure, however, is the property’s convenient location, right in the heart of the French Quarter, just steps from many of the city’s most popular sights and attractions, as well as its coveted balconies that are considered the very best on Bourbon Street. With a balcony, you can throw beads to the crowds during Mardis Gras right from your room, but if you prefer a quieter experience, choose one with a balcony that fronts quieter Toulouse Street. The hotel also boasts a romantic courtyard pool, and an exterior that bears the classic look of the area, while well-appointed rooms renovated in 2010 feature traditional décor and details like carved wooden bed frames, that give rooms more charm than you’d expect from a chain. Only Bourbon Street Balcony Rooms and the Petite Suite with Bourbon Street Balcony guarantee a balcony overlooking Bourbon Street, though other room categories do have some rooms with Bourbon Street views. Standard Rooms don't have balconies. King Rooms – The 268- to 275-square-foot King Rooms include one king-size Four Points Signature bed, views of the French Quarter and all standard amenities. Double Double Rooms – These rooms include two double-size beds in 268- to 275-square-feeet of space, along with French Quarter views and all standard amenities. King Rooms with Balcony – These 268- to 275-square foot rooms include one king-size Four Points Signature bed and a balcony that overlooks the courtyard. Double Double Rooms with Balcony – The 200- to 268-square-foot Double Double Rooms with Balcony include a balcony with views of Toulouse Street and two double-size Four Points Signature beds. Deluxe Rooms – The 200- to 268-square-foot Deluxe Rooms include a balcony with views over Bourbon Street and one king-size Four Points Signature bed. Junior Suites – The spacious Junior Suites contain 528 square feet, a balcony over Bourbon Street, a separate living area and one king-size Four Points Signature bed. Accessible Guest Rooms – These 268- to 300-square-foot rooms feature two double Four Points Signature beds along with a roll-in shower, grab bars in the bathtub and visual fire alarms. Café Opera provides casual breakfasts, while Puccini Bar serves fine Southern and local dishes for dinner, including crawfish and bouillabaisse with spicy Cajun broth. A poolside tiki bar offers cocktails, soda and water. There is also a limited room service menu. 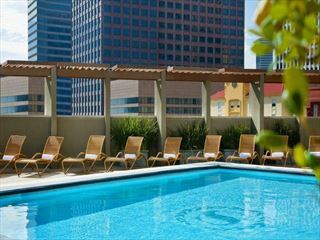 The aptly named Four Points French Quarter is set in the liveliest part of the French Quarter, right on Bourbon Street. Guests are steps away from the Mississippi River, the Aquarium of the Americas, streetcars, Jackson Square and endless world-class eateries.